The glorious weather we are currently experiencing is making now a perfect time to get out there and explore the UK. 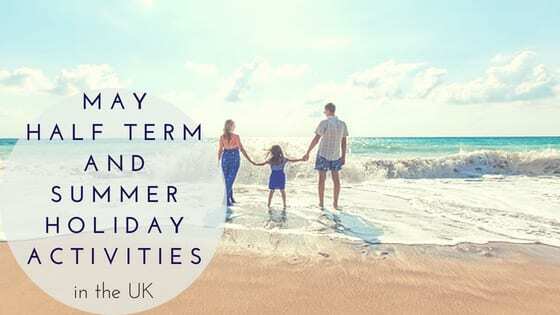 With the May Half Term and Summer holidays fast approaching, families may well be looking into outdoor activities to make the best of what looks to be our long awaited summer. Explore the World Heritage Site featuring ten award winning attractions, the theme over the May half term holidays is Create Colour and features lots of fun family activities. Immerse yourself in Victorian life as you visit the birth place of the Industrial Revolution, whilst enjoying fish and chips, with sweets from Blists Hill Victorian Town as a treat! With so much to see and take part in, a trip to Ironbridge Gorge is easily a full day trip, or extend with a short stay in the wonderful Shropshire surroundings. The price of a family pass (two adults and two children) which offers daytime admission to all ten attractions throughout the year is £66.50 when purchased from the IronBridge Gorge website. This summer between May and September, Leopold Square in Sheffield will be hosting its annual extensive programme of live entertainment, from funky jazz bands to soulful swing vocalists, in support of local musicians. Aaron Casserly Stewart will be taking to the stage on Saturday 26th May. Previously a member of the three-times Grammy award winning soul group ‘Sounds of Blackness’, his stunning voice and presence on stage is guaranteed to be a real hit! On Sunday 27th May ‘The Big Swing’ and ‘Salsa in The Square’ will be returning to celebrate the bank holiday in style. Visitors will be thoroughly entertained with an afternoon of decadent jazz, live music and Spanish Latina dancing. Movers and shakers can enjoy the sounds of Ryan Taylor Hammond Quartet who will be bringing the beat to the outdoor dance floor before visitors are invited to join Cubana Tapas Bar as it hosts its annual ‘Salsa in the Square’ event – a dancing spectacular perfect for those in the mood to move and shake their hips from 12pm until late. The events are free and are great for families to enjoy. This year, the annual Tramlines festival in Sheffield takes place on between Friday 20th and Sunday 22nd July at Hillsborough Park. One for music lovers, headliners this year are the Stereophonics, Noel Gallagher’s High Flying Birds and Craig David’s TS5. Whilst not necessarily a family festival, Tramlines does feature more family entertainment than ever before – details on ticket prices and the full line up can be found here. A visit to the Lake District over the holidays would not be completed without a trip to see the Fairy & Dragon World attraction at Hayes Garden World. Explore the Enchanted Forest with its fairy doors to see where the fairies live, but mind you don’t step on any! Play hook the dragon and unicorn then try your musical talents on our giant piano. Cross the stepping stones to put the dragon eggs back in his nest but shhhh, try not to wake the dragon! Visit Unicorn Valley to dig for fossils and try your hand at the fun dragon laser quest before entering the sensory room with ball pool and sensory games. Younger children will be enthralled by this award winning attraction – make sure you book tickets in advance via the website here. Don’t forget to join the Hayes Garden World Kids Club for more fun activities! Look for places to stay during the holidays? With campsites dotted all around England, Scotland and Wales, the Caravan and Camping Club has revolutionised camping as we know it. No longer do you need to struggle with putting up your own tent, simply arrive and head straight to your already assembled luxury safari tent, complete with electricity, real beds, a sofa and decking area. The glamping tents can sleep up to 6 people (max 4 adults) and feature all your home comforts. Find further details on Ready Camp locations and what to expect over at the Ready Camp website. If you have always wanted to go glamping and are considering visiting Dorset in the South West, then a stay at Caalm Camp is a must. Offering the most amazing traditional yurts, complete with comfy beds and a wood burning stove, turn up and kick back and relax in the peaceful surroundings in this idyllic part of the UK. Caalm Camp is situated south of Shaftesbury in Dorset, with the former dairy farm enjoying stunning views across the Blackmore Vale to Duncliffe Woods, Bulbarrow and Hambledon Hill. Availability and price details can be found on the Caalm Camp website. I haven’t been on a glamping holiday yet, ReadyCamp looks great for those who don’t usually camp.